Collecting postmarks of the German Empire post offices abroad can be educational AND rewarding. Germans of the late 19th and early 20th Centuries loved to travel, with North Africa and the Mediterranean being among their most popular destinations. For the specialist, the availability of stamps, postcards, and postal history of these areas is still pretty abundant. Some postmarks are very valuable, but the average worldwide collector or dealer has no specialized knowledge of them, so there is a real opportunity here to acquire some really nice postmarks at a minimal cost. 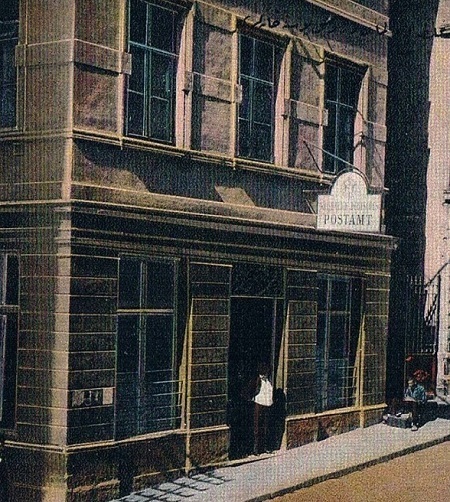 Some great ways to find postmarked German Empire offices abroad and colonial stamps are from bourse dealers, local stamp stores, collection lots, and my favorite, American Philatelic Society sales circuits. For German Empire post offices in the Turkish Empire, the following town cancellations are known. These are the German language names, as they are spelled on the postmarks. There are many types of some of these town cancels, as listed in the "Deutsche Kolonien und Auslandspostämter Stempelkatalog". The number of different postmark types for each post office is shown in parentheses in the table above and noted in the example descriptions below. TRUE, The German Empire post offices in the Turkish Empire were few in number, and they were closed at the beginning of World War I. BUT, there was also a lot of other German mail activity during this time and even throughout World War I. The three main categories of other postmarks are shown in the table below. Unfortunately, I have no examples to illustrate of the first category ... routing postmarks. Routing postmarks are almost never found on the postage stamp affixed to the envelope. They usually appear elsewhere on the envelope. Collecting these requires purchasing the entire envelopes that were processed through the mails. This can be a bit expensive, especially with German envelopes / covers. The markings are all illustrated in the "Deutsche Kolonien und Auslandspostämter Stempelkatalog". Up until the end of World War I, there were many German post offices on steamships and luxury liners traveling to and from ports in the Turkish Empire. The Steamship "General" (No.14), noted below, was actually a Turkish vessel. 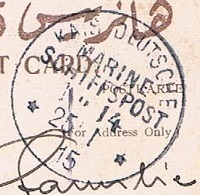 Most of the postmarks have the wording KAIS DEUTSCHE MARINE SCHIFFSPOST or IMPERIAL GERMAN MARINE SHIP POST OFFICE on them. An example is shown below, at the left. Each of the postmarks also has an individual SHIP NUMBER, identifying the particular vessel on which the post office was located. A fun sideline to collecting these may be to try and find a photograph or picture postcard showing the actual vessel on which the letter was carried! There were many German Empire military operations in various parts of the Turkish Empire (their ally), throughout all of World War I. Each military mission / operation maintained its own FELDPOST office or FIELD POST office, for the purpose of sending and receiving mail. The German feldpost markings encompass many locations, from the Mediterranean Sea to Persia! 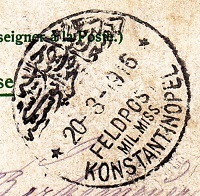 An example of one of the common feldpost postmarks is shown above at the right. The others are all illustrated and described in the book described below. German military mail was usually sent FREE FRANKED, meaning that postage stamps were not required on the letter or postal card. Thus, these military mission markings almost never occur on postage stamps. For anyone collecting or specializing in the postmarks of the German Offices in the Turkish Empire, you MUST HAVE the following specialized catalog. "Deutsche Kolonien und Auslandspostämter Stempelkatalog", published by the German Philatelic Federation. It contains illustrations and descriptions for all known postmarks and postmark varieties of the German Imperial post offices abroad and the German colonies, as well as their prices, in Euros, both on cover and on piece. It also contains listings for envelope transit markings, railway cancellations, ship cancellations, and feldpost cancellations. Copies of the book described above can be a bit difficult to locate. The 2003 and 2009 editions are the ones most frequently encountered. Here are some links to sites that currently have them for sale. PHILATHEK - Seller in Germany. All of the products above, even on the US eBay site, are located in Germany. Depending on the exchange rate with the EURO, the book will cost the buyer up to about $50.00 US, plus airmail shipping from Germany. This is a MOST WORTHWHILE INVESTMENT though.